NASA today (April 18) will announce the private companies who will receive funding awards to help develop technologies that will support the agency's commercial spaceship needs. The awards are part of the second round of NASA's Commercial Crew Development (CCDev) program, which is aimed at supporting growth within U.S. industry to develop and demonstrate human spaceflight capabilities. NASA is expected to announce at least four recipients for the nearly $300 million round two awards, according to Space News. After NASA's space shuttle program ends later this year, the agency will rely on commercial providers to carry cargo and eventually humans to the International Space Station. 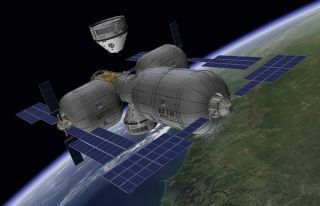 SpaceX and Orbital Sciences Corp. already have contracts with NASA to ferry supplies to the space station following the retirement of the veteran orbiters. Philip McAlister, acting director of commercial spaceflight development at NASA Headquarters in Washington, D.C.
Edward Mango, program manager of the commercial crew program at the Kennedy Space Center in Florida. Andrew Hunter, deputy chief financial officer at NASA Headquarters. Today's announcement comes on the heels of last week's political compromise that resulted in a new federal spending bill. On April 14, Congress passed a spending measure for the last five months of the year 2011. The bill left NASA with about $18.5 billion, putting its budget roughly $240 million below its 2010 funding level.